Don't let the size of Sony's 4GB Memory Stick PRO Duo media card fool you. This product has the largest storage capacity of any Memory Stick flash media card on the market. At one-third the size and half the weight of the standard-size Memory Stick card, the Sony 4GB PRO Duo media is designed to store large amounts of rich, multi-media content, including movies, music and high-resolution digital photos. The new media card is compatible with a wide selection of currently available devices, including Sony's Cyber-Shot T Series and W Series cameras, Handycam camcorders and the PSP system. The 4GB Memory Stick PRO Duo media card will be available in July for about $250. Sony Pro Duo - 4GB storage capacity - "As we've increased capacity, the Memory Stick format has advanced beyond serving primarily for storage of digital still images" said Mike Kahn, senior manager for Memory Stick Media at Sony Electronics. "With our postage-stamp sized 4GB Memory Stick PRO Duo media card, people can store all of their photos and videos, along with their favorite movies, music and even game-scores from a PlayStation Portable device." 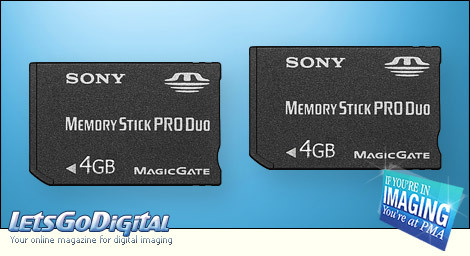 Sony Memory Stick Pro Duo - MagicGate - For added versatility, all Sony Memory Stick PRO Duo media cards are sold with an adapter for devices with a standard-size Memory Stick media slot. It also offers the industry's highest durability with a standard operating temperature range of -13 F to +185 F. Like all Memory Stick media products, the 4GB Memory Stick PRO Duo card incorporates MagicGate copyright protection technology to allow for secure distribution of commercial content such as digital music and downloaded movies. The 4GB Memory Stick PRO Duo media card will be available in July for about $250. Memory Stick File Secure Service - Sony also announced the Memory Stick File Rescue Service, which helps recover certain files lost through accidental deletions or data loss. This free service can be accessed on the Sony customer support web site. Customers will be asked to register the Memory Stick model name and product lot number prior to downloading the recovery software. The Memory Stick File Rescue Service can recover .jpg (DCF format), MPEG1 and .mp4 (MS Video File Format) files. It is compatible with all Sony Memory Stick cards sold since 1998. This free service will be available this summer.